After having sustained a number of foot and ankle injuries to their players, Navy football is making some changes to prevent future injuries. With three players having suffered from foot injuries and one from a knee injury, coaches had to find an answer. Two problems were discovered: turf fields and player footwear. 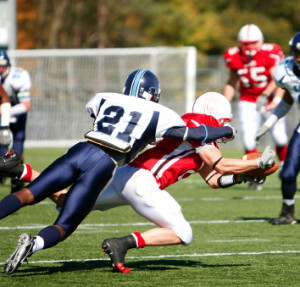 For some time, turf fields have come under scrutiny for potentially causing more injuries to players than grass fields. However when it came to footwear, the staff was in for a surprise. Most players were found wearing poorly-fitted cleats. Furthermore, most Navy players must wear dress shoes to classes, which are less comfortable. To solve this, players were all examined to determine if they needed orthotics for their dress shoes to give them better support. Players were also considered for custom-fitted cleats, if needed. Coaches and staff are now feeling more confident that they’ll be better prepared for potential future injuries. Researchers from South Korea have discovered a new method to predict if bunions will reemerge after surgery. 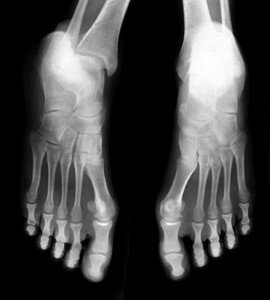 The team utilized X-ray imaging and identified reemergence as a hallux valgus angle (HVA) of 20 degrees or more. Using this information, the team was able to predict the recurrence of bunions. Recurrence was more likely if the postoperative HVA was eight degrees or more. An HVA of 40 degrees or more also increased the likelihood of reemergence after surgery. The researchers are hopeful that more research will confirm the data, as this could help future surgeries and patients. 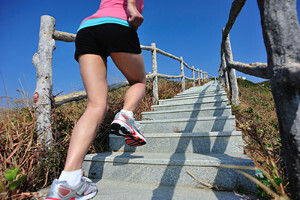 It is very possible that the cause of your hip, back, or knee pain could be your feet. You should try to take care of your feet and make sure that they are strong and healthy so that you can avoid having pain in other areas of your body. One of the simplest exercises you can do to strengthen your feet are toe presses. In order to do this, you should bend your knees, grip the ground with your toes, hold the position for a few seconds, and then release. Another exercise is to walk on your tiptoes for twenty seconds. Doing this can help strengthen the muscles in your toes as well as the ligaments that surround the ball of the foot. Some foot health exercises can include ankle pumps, tip-toeing, toe rises, lifting off the floor doing reps and sets, and flexing the toes. It is best to speak with yDr. Manger to determine an appropriate regimen for your needs. Everyone’s needs and bodies are different, and the activities required to maintain strength in the feet vary from individual to individual. Ronald Matarrita of the NYCFC has recently made his return after suffering from a sprained ankle. Unfortunately, the fullback fractured his fifth metatarsal, an injury that will require a recovery time of 3 to 4 months. If he is able to follow through with that timeline, Matarrita is expected to return only to play the final weeks of the season. NYCFC has shown that they are capable of winning without the fullback, and they have experienced success with his replacement, Ben Sweat. The team just finished a game against Minnesota, which they won by a score of 3-1. 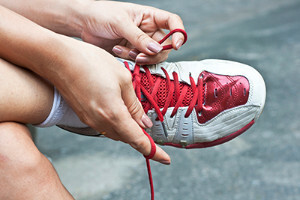 In order to avoid injury, you should be sure to choose the right pair of shoes to wear. Shoes that fit poorly will not only make you uncomfortable, but also give you pain in your feet and aggravate pre-existing conditions. Shoe-lacing techniques have been found to alleviate foot pain, prevent injury, and relieve foot problems. While most people tend to use the criss-cross shoe lacing technique, alternate techniques have been found to prevent heel slippage, bone prominence, and darkening of the toenails. Jean Segura of the Seattle Mariners recently sprained his ankle in a game against the Rockies. The shortstop said that “It was feeling really bad the first day,” and that he’s been feeling “much better” in the days following the injury. He suffered the ankle injury during the fourth inning as he slid into second base attempting to advance on a sac fly. Segura who batted .341 so far this season with an OPS of .391 has been called “impossible” to replace by minor leaguer Tyler Smith. His presence will surely be missed by the Mariners and Segura is eager to begin rehab so he can rejoin the team as soon as possible. Ankle sprains are common, but need immediate attention. If you need your feet checked, contact Dr. Donald Manger from Associated Podiatric Physicians, PA. Dr. Manger can provide the care you need to keep you pain-free and on your feet. The most important function of our blood is to deliver oxygen from our lungs to the farthest parts of our body while removing carbon dioxide and other waste products. Hormones, immune cells, and signalling molecules all travel through the blood in order to support the body's vital processes. Poor blood circulation can occur as we age and is associated with various diseases. Numbness and tingling in the feet are common symptoms of poor blood flow. Coldness in the feet is also a symptom of poor blood flow since the blood is meant to keep the body at a stable, warm temperature. Lastly, foot pain may also be a sign of poor circulation. This may occur after standing or sitting down for a long period of time. The first step to getting into a proper running routine is to make sure you are wearing the right running shoes. The proper shoe will help to correct biomechanical issues and prevent injury. You should always go to a sneaker store that specializes in running shoes so that the workers can help you find a sneaker that fits your foot strike. There are three main types of runners based on foot strikes: overpronators (when the foot rolls inward too much), neutral pronators (feet roll inward slightly), and supinators (feet don’t roll inward enough). Certain running shoe stores will have you run on a treadmill so that the workers can best determine which shoe type will fit you properly. You will know the shoe is a good fit if you “feel like you want to go run immediately," said runner Dimity McDowell. If you are a runner, wearing the right running shoe is essential. For more information, contact Dr. Donald Manger from Associated Podiatric Physicians, PA. Dr. Manger can provide the care you need to keep you pain-free and on your feet. When the weather warms up, it is tempting for women to choose high heels as their choice of footwear. However, the human foot is built to walk on natural grounds, without the use of a high heeled shoe. Heels cause feet to shift into an unusually inclined position, which therefore results in foot damage. Most humans are born with healthy feet, with the damage developing over time. It is important to take precautions in terms of taking care of your feet, and choosing not to wear heels may preserve their health.